Austrian psychiatrist; born at Gross-Meseritsch, Moravia, July 20, 1851; educated at Berlin and Vienna (M.D. 1875). 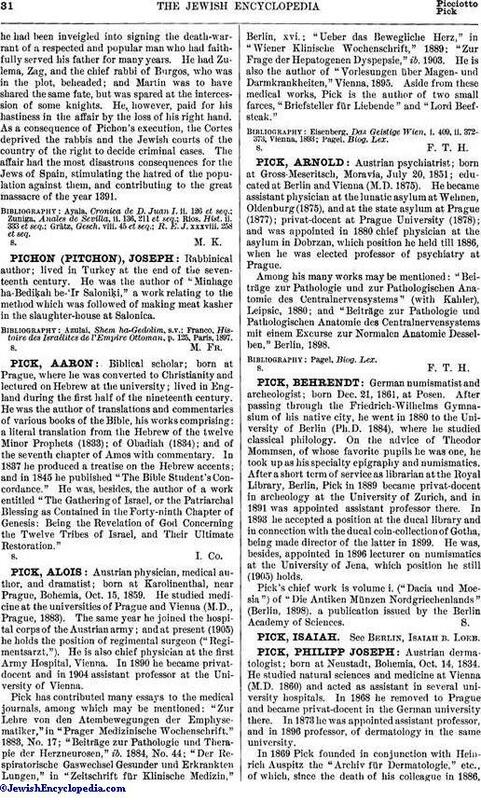 He became assistant physician at the lunatic asylum at Wehnen, Oldenburg (1875), and at the state asylum at Prague (1877); privat-docent at Prague University (1878); and was appointed in 1880 chief physician at the asylum in Dobrzan, which position he held till 1886, when he was elected professor of psychiatry at Prague. Among his many works may be mentioned: "Beiträge zur Pathologie und zur Pathologischen Anatomie des Centralnervensystems" (with Kahler), Leipsic, 1880; and "Beiträge zur Pathologie und Pathologischen Anatomie des Centralnervensystems mit einem Excurse zur Normalen Anatomie Desselben," Berlin, 1898.